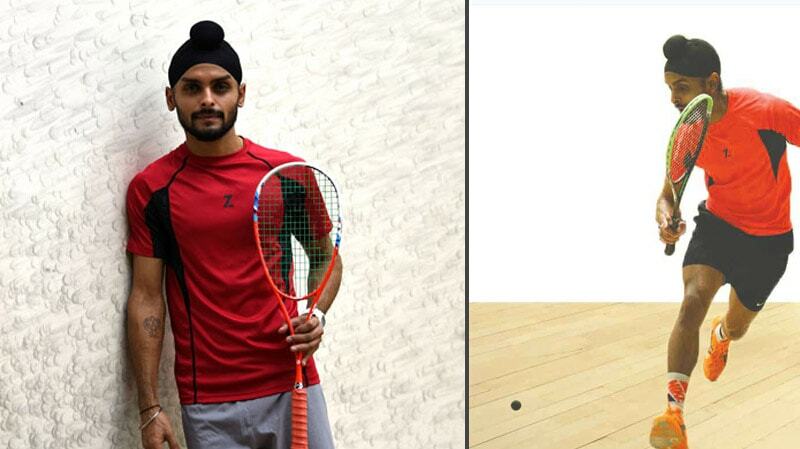 Harinder Pal Sandhu is a professional squash player who plays for India. He has achieved career-high world ranking no. 56 back in September 2015 currently he stands at no. 69. He was a part of the Indian team, who won the Gold Medal at the 2014 Asian Games held at Incheon. He is a very humble and gentle human being. MSM-2 student Prashant Tayde speaks to Sandhu in a candid chat. How was the attitude of your parents towards the sport when you start playing? My parents were quite happy as I started playing squash since I was good in athletics and I also played cricket, hockey and football and squash was a new game. They asked and encouraged me to play squash as my coach was supporting me to play squash.I tried and later got interested in squash. What sort of problems did you face during your rise as a national player? My biggest challenge was to move to Chennai when I was just 13 years old. But I had in my mind that I will be training in the best squash academy in India and that was a big motivation for me. I faced culture, language and food problems when I moved here but slowly got the hang of things. There was a desire to do well in the sport and make the parents proud as I come from a middle class and a very simple family and a small town and moving to a big city was a challenge for me but the love for the sports kept me going and keeps me going till now. What is the selection process to get selected for the state and national team? To get selected you need to do well in nationals’ i.e. junior national championship. If in that you finish in top 4 in the category, you are one of the top players from your state and if you remain top you automatically get a call from the national coach for the selection process to represent the country in the junior championship. This is one of a major step to make it to in the India Team. What are the similarities and differences between today and the day you started squash? When I first started playing squash, I used to play on a cemented court, now the flooring is wooden. Playing on a cemented court is very hard, your knees get bruised, your shoes get torn out, and your toes start to bleed and your knuckles bleed when you pick up tough shots. And later the seniors and our coach pushed the school authorities to make a wooden floor so that we could do well. Now, there is a lot of squash that is shown on the TV and kids can sit at home and watch the top players and learn how to play. When I was playing our coach used get squash magazines from abroad and we used to fight before and after practice as who is going to read and we used to learn how the players are doing and now you can just go on YouTube and TV and watch any number of matches of top players. With the time it is easier for the kids to learn and the training has changed significantly. What would be your ultimate achievement and your goals? My ultimate goal is to reach top 10 in the world. But it is not an easy feat to achieve; still there is a lot of work to be done, lot of matches to be won before that. It’s all a process and it’s all in process and hopefully things will come into plan. What advice would you like to give to the young kids who all are willing to take up squash as a career? All I say to them that the first few steps are the hardest, you can’t really imagine after few weeks or few months that you will expect yourself to become better in a sport that is not very common in our country. There are always going to be hardships, physically, mentally, financially, the availability of the squash court. It’s all a process, everybody has to go through it, I especially went through it a lot and if I would have stopped then I would have not been present here right now. All I would tell them is to listen to your coaches, everyday work hard, grind it out; your concentration has to be at 100% every day, every single session, and the desire has to be there even if you win and if you lose you train the hardest that you ever trained in your life. All I would say is that keep your head down and work hard every day and be sincere and there is no shortcut in any aspect of life so always work hard and always listen to your coaches to whatever they say. How do you see the future of squash in India? The future is bright from here as the kids can decide whether they want to play for long term or not and hopefully things will change better for the kids to take up the sport and make this as a livelihood and put them on a better path in the future. Even after they finish playing, many government jobs coming up and multinational companies giving jobs to squash players. Still lot of things can be done and right now squash is getting popularised more with all the national senior players doing well which is very important for the game and for the young and upcoming players to see the players doing well can be a big motivation for them.